'D' Coy, 1/8th Bn, The Worcestershire Regiment, 144th Brigade, 48th Division, B.E.F. Next of Kin: Only son of the late Mr James Williams, of Yarrington’s Farm, Alfrick, and nephew of Mr A G Lewis, builder, West Malvern. 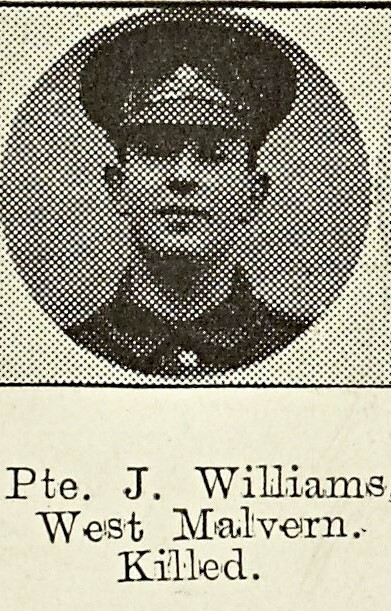 James Williams was the only son of the late Mr James Williams, of Yarrington’s Farm, Alfrick, and nephew of Mr A G Lewis, builder, West Malvern. James was educated at the Lyttelton Grammar School, Malvern and was a member of the Priory Church choir. He afterwards belonged to West Malvern church choir, and Miss Howl’s singing class held at her residence, Glenbrook. In employment he was apprenticed to Messrs Stevens & Co, grocers, West Malvern. “It is with great regret that I write to inform you of the death of your son. He was struck by a shell while doing his duty in the trenches on February 23rd. Death must have been instantaneous, so it may be some consolation to you to know that he suffered no pain. Please accept my deepest sympathy in your great sorrow. Your son has been in my platoon ever since he came out, and he always been a good soldier, cheerful, and ready to do his duty. The Worcestershire men presented clear targets to German snipers. Over the previous 24 hours one man was killed and six were wounded by snipers. Extricating men of the 1/4th Gloucestershire Regiment who had previously held the line continued. The final man being pulled from the mud and reaching Company headquarters in the early evening of the 23rd – over 48 hours after he should have been relieved. At 7.30pm a heavy bombardment was heard away to the battalion’s right which quickly spread up to the men and beyond. SOS flares were soon sent up in two places on the right and once on the left calling in emergency retaliatory artillery fire. The enemy did not come out of their trenches in front of the on the 1/8th Worcesters but the inter-Company relief got caught in the barrage and suffered casualties. Among ‘D’ Company who were moving forward in the open 5 men were killed and 7 wounded. In total 8 men were killed and 32 men were wounded during the day. The battalion’s stretcher bearers worked unceasingly to dress and evacuate the wounded – four of them were subsequently awarded the Military Medal (L/Cpl Walters, Pte Lavender, Pte Amos and Pte Banner).